Border Village is located 12 kilometres east of Eucla and 187 kilometres west of Nullarbor Roadhouse. Situated just 50 metres east of the Western Australian Agricultural checkpoint, Border Village acts very much as a gateway to both South Australia and Western Australia. Nullarbor travelers will appreciate a short stop at Border Village. 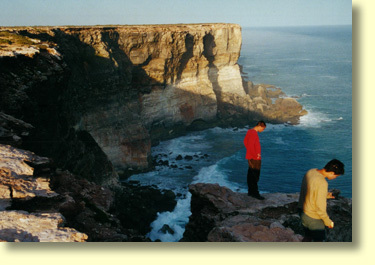 The traditional owners of the coastal strip of land in this area of the Nullarbor were the Mirning people. Tentative European explorations of the Nullarbor commenced with Edward John Eyre's expedition of 1841. At the time Eyre and his 4 fellow expeditioners were engaged in a desperate quest for rich grazing lands and an overland passage to King George's Sound in Western Australia. South of Border Village, Eyre's expedition very nearly came to a calamitous end with the party forced to endure a waterless 5 day trek across the Bunda Cliffs. Salvation later came to hand when Eyre discovered native wells in the sandhills at nearby Eucla. The SA-WA Border: No Man's Land! At the time of Eyre's explorations the territory lying between the Head of Bight and Border Village was held to be part of New South Wales. The "Bight Rectangle" as it became known stretched as far north as the Great Victoria Desert and the present day boundary of the Northern Territory. Isolated from the eastern coast of New South Wales it made good political sense to transfer the "Bight Rectangle" to South Australia's colonial government. Transfer of sovereignty finally occurred in December 1861. Border Village is a relatively new settlement and today its sole purpose for existence is to serve the needs of passing travelers and the freight hauling industry. Border Village Roadhouse has good modern amenities, EFTPOS facilities, and is open 7 days a week 24 hours a day. If you are heading west a short rest break is recommended given that your vehicle will be required to undergo a compulsory quarantine inspection at the nearby Western Australian Agricultural checkpoint. Within the Border Village Roadhouse travelers will find a Motel with licensed bar and restaurant. Dormitory accommodation is also available for Backpackers. Caravan Park facilities are also available although there are no on-site vans available for hire. Useful facilities for travelers include take away food services, pay public showers, pay telephones and an internet service for those of you needing to email home. Bookings and further information can be obtained by telephoning (08) 9039 3474, or faxing (08) 9039 3473. Travelers heading to the east of Border Village should definitely take the time to view the Bunda Cliffs - situated just to the south of the Eyre Highway. Between Border Village and Nullarbor Roadhouse are 6 or so scenic lookouts, some with perpendicular limestone cliffs dropping 90 metres or so into the Southern Ocean. Occasionally Southern Right Whales can be seen here in their winter nursery grounds - between May and October. Visitors should note that some scenic lookouts are definitely much more spectacular than others, and for those of you who have a fear of heights we recommend you stay in the car until your friends return! Another word of warning: Nullarbor Net urges you to avoid approaching cliff edges too closely as these limestone cliffs are prone to crumbling into the ocean below. Having said that, bring your camera, take some snaps and enjoy some truly stunning cliff top scenery. This is dangerous. Please don't do it! 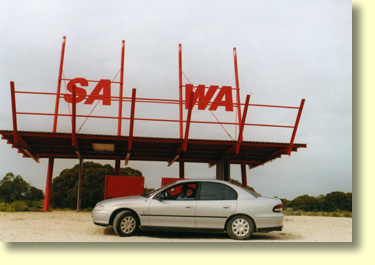 Between Border Village and Nullarbor Roadhouse travelers will find numerous rest stops, many of which are suitable for overnight camping. Travelers should be aware that during summer daily maximum temperatures can often exceed 40 degrees celsius. 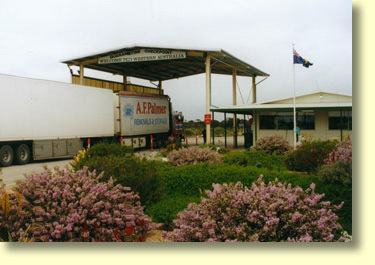 If you are heading to Western Australia the Agricultural Checkpoint is located on the border - 50 metres west of Border Village. Travelers are advised fresh fruit, seeds, honey, plant material and soil will be confiscated. For those of you with long haired pet dogs, be prepared to brush their coats in order to remove any offending stray grass seeds! Travelers heading across the Nullarbor in a westerly direction should note South Australia's checkpoint is located at Ceduna - 500 kilometres east of Border Village.